Hotel lodging in Japan tends to be very expensive, but is characterized by superior service and decor. Hotel staff strive to be polite, and to create a clean and well-furnished environment. The internet is a reliable source of information for hotel rates; one can often find specials and coupons online. 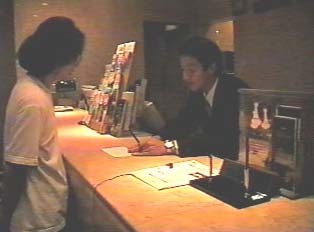 One should try to avoid hotels during Japanese holidays as the rates soar during these times. Hotel restaurants tend to be expensive yet of lesser quality, therefore it pays to eat outside of the hotel. An exception is the lunchtime buffets some hotels offer, which often feature delicious food at reasonable prices. "Reserving a Room in Person"